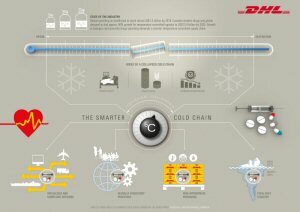 A new generation of cold chains needs to be developed for the life sciences and healthcare industry to improve global health standards, according to new research by DHL Global Forwarding. 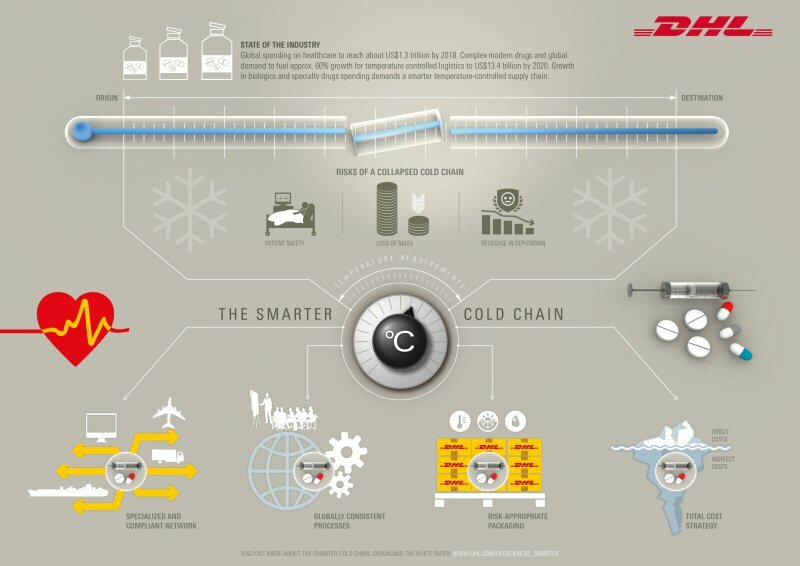 DHL's white paper "The Smarter Cold Chain: Four essentials every company should adopt" highlights the critical challenges facing the healthcare industry as global demand for expensive structurally complex and temperature-sensitive biologics and specialty drugs grows. This latest report was published during DHL's 15th Global Annual Life Sciences & Healthcare conference, held in Hamburg, Germany from June 15 to 17. "Astounding developments in the life sciences industry coupled with globalization means there is an opportunity for better health, pain relief and cure from disease for many millions of people around the world," said Frank Appel, CEO of Deutsche Post DHL Group. "But getting the medication to patients in the right condition and achieving that goal requires a complex balancing of cost and risk. It emphasizes yet again the strong link between trade, logistics and the impact it has on improving people´s lives." Pharmaceuticals are expensive and sensitive - and product integrity is paramount as ultimately someone's health and even life may depend upon it. With global demand, particularly in emerging markets, growing hand in hand with ever stricter compliance from regulators, the industry faces a critical situation unless a new generation of cold chains are developed that can support growth aspirations and at the same time safeguard products. Global spending on healthcare is forecasted to reach around US$1.3 trillion by 2018 and the World Economic Forum estimates that by 2020 one third of all global health expenditure will be in emerging markets. Specialty drugs and biologics are one of the fastest growth areas with US spending on specialty drugs to quadruple to US$401.7 billion in 5 years, according to PricewaterhouseCoopers, with similar growth rates being projected for the rest of the world. These highly sensitive pharmaceuticals bring new complexity to the supply chain since they have specific condition tolerances and a high value. Annual per-patient treatment costs can be up to and above US$100,000, making a single consignment worth up to US$50 million. The distribution of these complex drugs and increased global demand is predicted to fuel approximately 60 percent growth in cold chain logistics reaching US$13.4 billion by 2020. (2) The Indian market research company IMARC Group estimates an expansion from currently USD 8.5 billion to nearly USD 13.4 billion by 2020. "Collapsed cold chains due to non-appropriate conditions can result in loss of a shipment worth hundreds of thousands of dollars. Over the longer term, this can lead to a damaged reputation, slumping sales, potential share value and even pose a risk to patients. These are high stakes and a smarter supply chain is necessary to overcome these challenges. As the life sciences and healthcare industry expands and transforms to meet the growing needs of the world, logistics providers need specialist investment in research and development as well to be able to offer the expertise needed to get medicine and equipment to the patients. In the simplest terms: better logistics can contribute to better healthcare," said Angelos Orfanos, President Life Sciences & Healthcare, DHL Customer Solutions & Innovation. According to the research, life sciences and healthcare companies that want to overcome the challenges of maintaining product integrity, regardless of the climactic conditions faced during global distribution, will need to build new generation of cold chains. Lisa Harrington, President of the lharrington group and Senior Research Fellow, Robert H. Smith School of Business, University of Maryland, and author of the research, recommends companies collaborate with logistics service providers that have the right infrastructure in place and can ensure consistent processes on a global level. "Securing product integrity requires the physical infrastructure to be designed and operated for life sciences products only," Harrington says. "It also requires having the right staff in place who fully understand end-to-end cold chain compliance. As providers of life-saving products, life sciences and healthcare companies have a responsibility to protect the lives of patients. Making sure their products arrive in perfect condition is critical. Partnering with the right logistics provider can ensure that." The white paper urges pharmaceutical companies to build high-performance partnerships to create and manage highly complex, next-generation supply chains. These partnerships need to be firmly based on a foundation of collaboration at both the strategic and tactical levels - all focused toward one common goal: serving the health of the patient. "In the current market situation, regulated by stricter compliance requirements, a robust packaging material is not enough to ensure a constant temperature range for a product," stresses Nigel Wing, Global Head Life Sciences & Healthcare, DHL Global Forwarding. "If not complemented by two critical essentials - a highly specialized and compliant network, and the right processes and people, packaging alone cannot do the job. Moving these goods across borders, especially in emerging markets, requires expertise and precision that currently only few can deliver. For example, DHL employs pharmacists around the world to oversee our operations, ensuring we comply with product and safety standards and helping us improve quality at every link in the supply chain." On their way to the "next-generation" cold chain, pharmaceutical companies should implement a third essential into their supply chain, the report says. This tackles packaging and finding the right balance between costs and risk. Today, shippers can choose between passive and active solutions. When making their decision though, manufacturers must consider a wide range of factors, such as the value of the product, its temperature-management needs, regulatory compliance requirements, customer and market risk, as well as total cost. Finally, the fourth essential of a smarter supply chain is better cost management. According to the study, quite often, companies base their supply chain decisions on the direct costs visible to them, e.g. transportation or packaging costs. However, that's just the tip of the iceberg. Potential indirect costs such as product losses, brand risks and regulatory issues are usually not accounted for due to the different siloes in an organization. To ensure a smart supply chain for its life sciences and healthcare customers, DHL developed over time a rich product portfolio that caters for all needs and all transport modes. For managing temperature sensitive air freight shipments, DHL Global Forwarding implemented a new global standard called DHL Thermonet. Furthermore, for customer interested in shipping their goods via ocean, DHL Ocean Secure is the global standard for high value and sensitive goods. A door-to-door courier transport solution, 'Life Sciences graded Specialty Courier', covers for the specific needs of the life sciences industry and complements another product offer, Medical Express, which is based on DHL Express's global network and time definite express service. With 'DHL Clinical Trial Logistics' we provide logistics services for clinical trial materials including investigational medication, ancillaries and lab kits. Notes to editors: The report "The smarter cold chain: Four essentials every company should adopt" is available for download at www.dhl.com/lifesciences_smarter . DHL is the leading global brand in the logistics industry. DHL's family of divisions offer an unrivalled portfolio of logistics services ranging from national and international parcel delivery, international express, road, air and ocean transport to industrial supply chain management. With about 325,000 employees in over 220 countries and territories worldwide, DHL connects people and businesses securely and reliably, enabling global trade flows. With specialized solutions for growth markets and industries including e-commerce, technology, life sciences and healthcare, energy, automotive and retail, a proven commitment to corporate responsibility and an unrivalled presence in developing markets, DHL is decisively positioned as "The logistics company for the world".